DIY picture frames are a great way to decorate your home, not only because you get to enjoy a beautiful memory, but also because of all the pretty picture frames designs you can make. 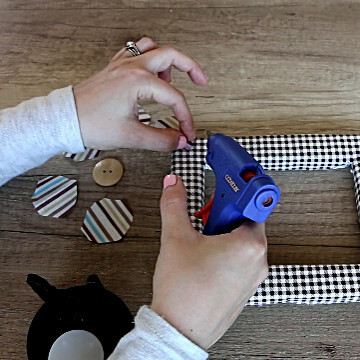 We have covered a few picture frame craft ideas in the past, and today we will continue exploring the DIY picture frame projects with a cheap, simple, and easy to make DIY picture frame covered with fabric. 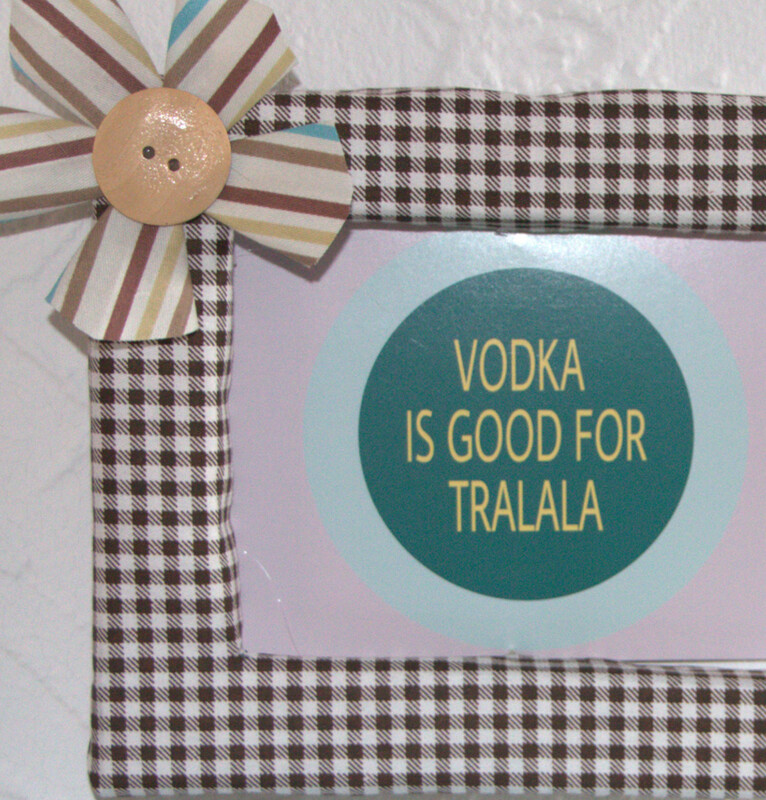 One of the great features of this DIY frame is that it can be completed with things you already have at home. We will be using 2 square fabric patches (a couple of cute old shirt will work), a rectangular styrofoam piece, a large button, and some hot glue. 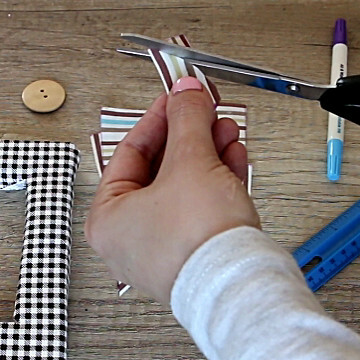 If you have these materials handy, you will need about 30 minutes to make the DIY picture frame. If you are missing something, below you can find the materials we used. To start, measure the dimensions of the picture or postcard you’d like to frame. 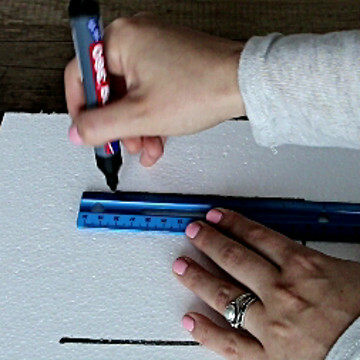 Subtract half an inch from each of the dimensions and use a marker to trace down these smaller dimensions on the styrofoam. 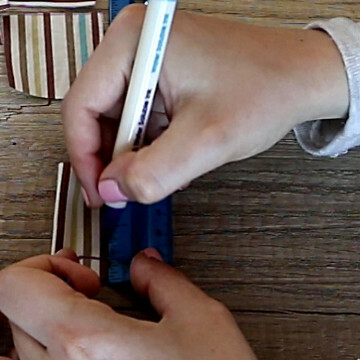 Then, draw a second rectangle with dimensions 1″ larger than those of the first rectangle. Cut the outer and the inner rectangle. This will give you the shape of the photo frame. 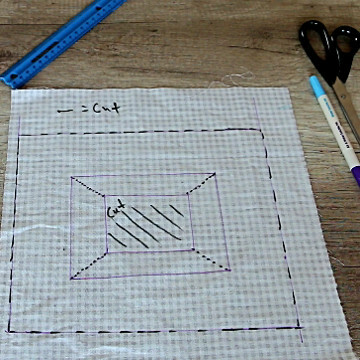 On a piece of fabric, draw a rectangle half an inch smaller than the photo dimensions. 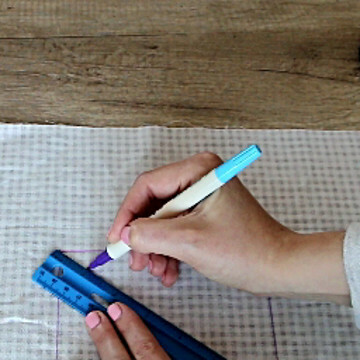 You can use a vanishing fabric marker to make this step easier. Trace 1 and a half inches long diagonal lines pointing inward from the corners of the rectangle. Keep in mind that the length of the diagonal lines is equal to the thickness of the styrofoam frame plus 1/2″. For example, if your styrofoam is 2″ thick, the diagonal lines should be 2 and a half inches long. 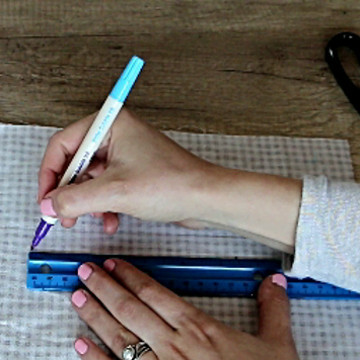 Make sure to measure the thickness and use it to determine the length of the lines. Draw one smaller, inner rectangle, ending at the diagonal lines. 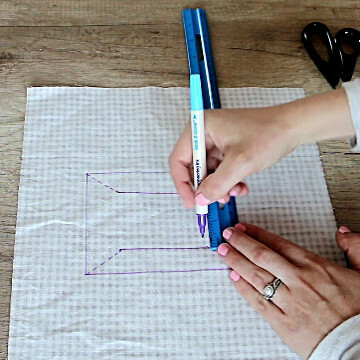 Then, draw a rectangle with dimensions 2″ larger than the original rectangle. Note that here again the dimensions depend on the thickness of the styrofoam frame. If the frame you have is thicker than 1″, add 2″to the difference. This will give you the dimensions of the larger rectangle. 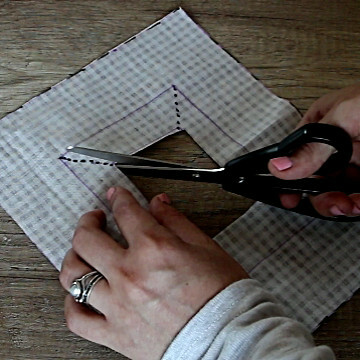 Cut the largest rectangle, the smallest rectangle, and along the diagonal lines. 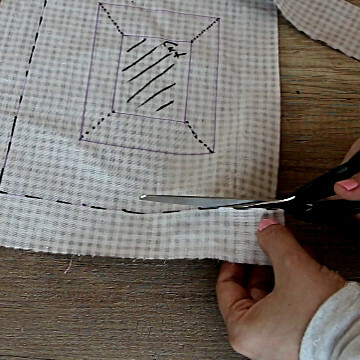 If you are having trouble cutting the small rectangle, just fold the fabric in half and then cut. 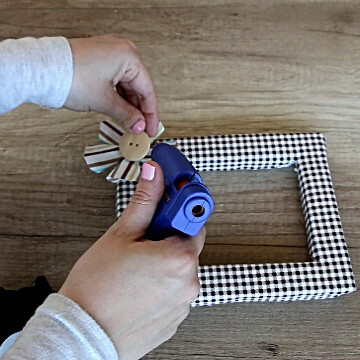 Apply hot glue along the edge of the fabric and glue it on the DIY picture frame. 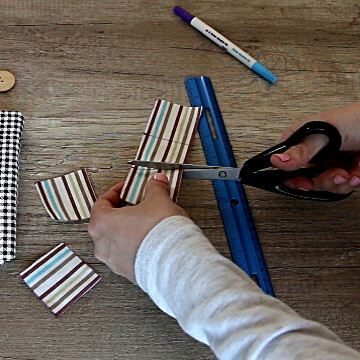 Cut five 2″ by 2″ squares from a different fabric patch. 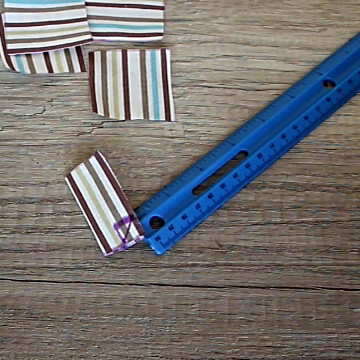 Then, fold each square in half and mark 1/2″ from its outer edge. 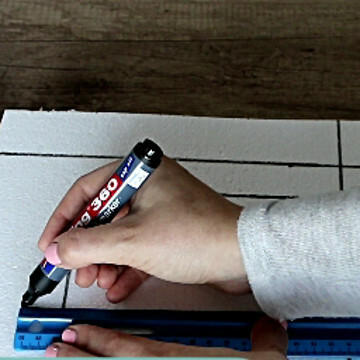 Cut diagonally between these 1/2″ markers. 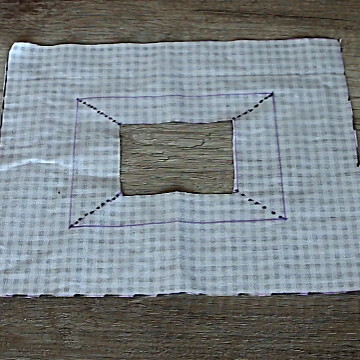 Next, keep the square folded and shape its top in the form of a petal. 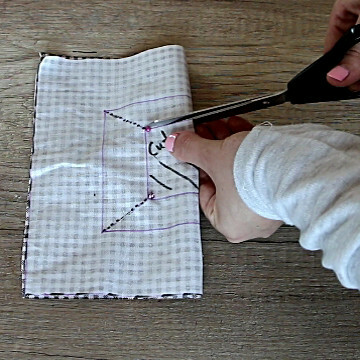 Use this folded fabric patch to also cut and shape the rest of the squares. 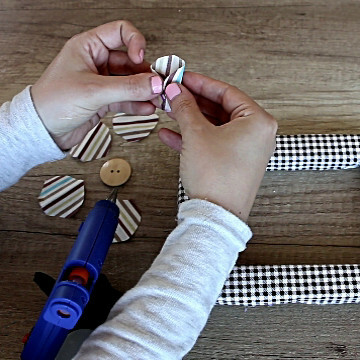 Glue the folded fabric patches on the DIY fabric picture frame and add a button in the center. 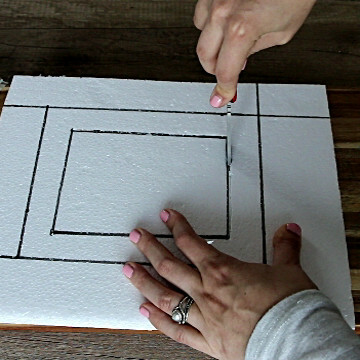 Use thumbtacks to attach the picture to the styrofoam frame. 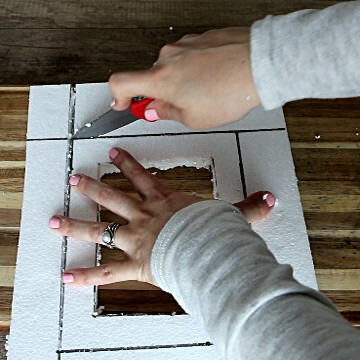 To hang the frame on the wall, push a nail in the back of the styrofoam. The decoration makes the weight of the frame uneven and to accommodate that you will need to position the nail closer to the end with decoration, not in the middle of the frame.